The very beginnings of a card based on the character of Aragorn from the Lord of the Rings. You can just barely see the under drawing scribbled beneath the more finished face. 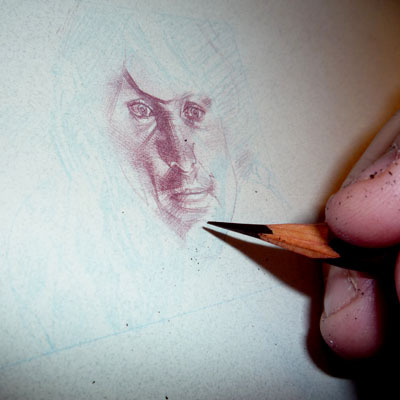 I do a light, quick (no more than a few minutes) sketch in blue pencil, before I start rendering the piece in red. It helps me get the proportions right, the eyes go here, the nose here, the mouth, what have you. I like to draw very tightly and very detailed, finishing each section as I go, so the under drawing acts like a road map, making sure everything ends up where its suppose to. Speaking of making things fit, this is the new home for the daily updates. Right here at the bottom of the first page. This way I can keep the galleries clean and easy to navigate (which is my main concern) but still hit the site with daily updates and (this is the part that was driving me crazy) have a place to store all the post, so if someone wants to read what I said three days ago they still can. I think its a good solution, we’ll see how it go’s and how everyone likes it. .